Achintya Venkatesh reviews the new release from Kalmah titled ‘Seventh Swamphony‘, released via Spinefarm Records. Cover art was done by the brilliant Juha Vuorma. He’s also done artwork for Autopsy, Edge of Sanity and other bands as well. Kalmah is one of those bands that I feel haven’t got the their due and deserved attention, even within the realm of melodic death-metal, overshadowed by a range of bands both within their specific sub-genre and furthermore by their world famous fellow ethnic compatriots, Children of Bodom, who in my opinion are even less consistent than the contingent of the second tier melodic death-metal bands from Finland, such as the immensely talented Wintersun (who also combine other eclectic folk/power metal elements in addition to their melodic death-metal style); the now defunct Norther, Swallow the Sun (who also have strong doom/death metal leanings) and Insomnium. Yet this is precisely what I would attribute Kalmah’s strong consistency and stylistic integrity over the years to – their relatively moderate popularity in turn leading to a cult following has only further fuelled the fire in their belly to continue to break boundaries and out do themselves, or at the very least annually churn out some reasonably unique and easily enjoyable tunes. 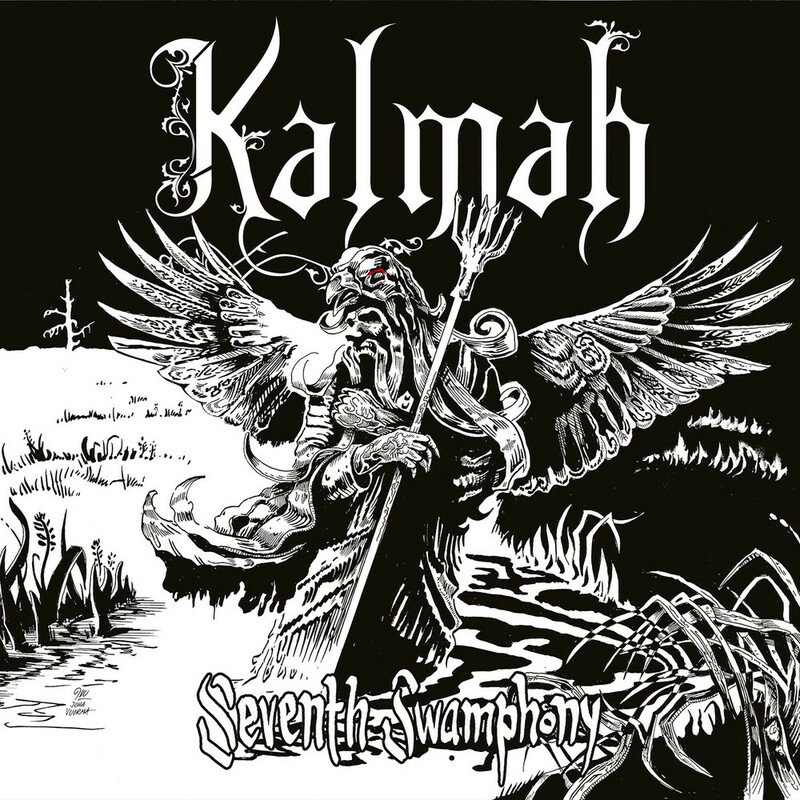 Kalmah’s latest offering, Seventh Swamphony, once again a play on the word symphony in line with their thematic obsession with the environment, particularly revolving around the swamps of Finland, as well as a reference to the fact that the album happens to be their seventh studio album. The album opener, which is the title track of the album, is a ball-busting start to the record, with blast beats, technical and blistering guitar solos, melodic, sing-along riffs and the right amount of dramatic keyboard work accompanying the riffage. The 2nd track, Deadfall too is in a similar vein. The 3rd track, Pikemaster is one of the standouts of the album and sees Kalmah’s ever so impeccable execution of grandeur in balancing melody and brutality, with a strong leaning to the former, of course. The next track, Hollo, charters into slower-paced territory and is a semi-ballad of sorts with an anthemic edge to it as the track progresses. The track features some emotionally evocative guitar work with harmonies at select and appropriate parts. Pekka Kokko alternates between roared, growled vocals, and subtle but somewhat tenuous clean passages. The 5th track Windlake Tale exemplifies epic in every sense of the word – blistering leads; hauntingly emotive and dramatic keyboard work and a barrage of roared vocals. The next track, Wolves on the Throne features some excellent fret-work in the form of uniquely sharp, relentless and hard-hitting riffs complimented by the bombardment of controlled blast-beats courtesy of Janne Kusmin. On the other hand, Veli-Matti Kananen seems to know just how to complement and enhance those heavy riffs with breathtakingly electrifying keyboard work. The 7th track, Black Marten’s Race is a fairly conventional, anthemic Scandinavian melo-death song with some interesting keyboard work. The album closer, The Trapper, has a more marching pace relative to the velocity-driven songs on the rest of the album. This actually makes for a perfect album closer, and kudos to Kalmah for placing this appropriately in the track listing. All the elements, be it the vocals or the instrumentation are in an equilibrium of sorts, working together as opposed to trying to outshine the other, and is perhaps the most balanced track of the album. But to some, this closer might seem too slow or even plodding as compared to the other tracks and might not suffice as the theatrical and dynamic album closer that Kalmah intended it to be. In conclusion, this album is an undoubtedly solid, but not particular groundbreaking release. The Kokko brothers have retained the crispness and sophistication that they derive from classic/power metal which has in turn lead to a unique brand of refined melodic death-metal, which gives a feel-good, invigorating vibe to the end product. Kananen’s keyboard work handles dramatism in a classy manner without descending into incessant melodrama, while Kusmin’s drum work also alternates between relentlessness and calculated restraint. Unfortunately, Timo Lehtinen’s bass is hardly audible in the mix throughout the album, except during a select segment of Wolves on the Throne. Overall this album seems to only further reinforce the fact that Kalmah is a somewhat underrated yet formidable force in the melodic death-metal world and adds to their solid catalogue. Kalmah are well and back in shape after the sub-par For The Revolution and the return-to-form release 12 Gauge. They have lost that touch of blackened ferocity they once had and instead have replaced that with something vaguely thrashy, making them less unique but very enjoyable nevertheless. Review of the new album from Chthonic titled Bu-Tik, released via Spinefarm Records. One can only imagine the immense political allegory behind it, given the band’s penchant for driven political activism. An element that runs the entire gamut of the Chthonic discography. No Chthonic review is complete without a brief insight into the deep political well of Taiwan from which their work ceaselessly draws from. For instance let us take the case of their last three records. The critically acclaimed Seediq Bale, the one album that put Chthonic on the international metal map talked about the infamous Wushe massacre where thousands of native Seediq tribesmen were slaughtered by the colonial Japanese. The less successful Mirror of Retribution took to the 228 incident where an altercation between the civilian populace and the then Chinese government developed into a full scale genocide. Finally their last album Takasago Army which portrayed the courage and valor rooted in the heroism of Takasago volunteers. You ought to read about Teruo Nakamura who made his living off an island for 30 years after the bloody great holocaust did come to an official end. Talk about loyalty. Come to their new album and it is no different in character. It is a beast armed to the teeth with unbridled fury but sometimes found ailing in a few places. Bu-Tik much like its predecessor shows the band partially abandoning their uber-cheese symphonic black metal moments. Seediq Bale thrived on this very fact but was more cohesive overall and was in fact one could their own brand of oriental metal. Although the keyboards had a slightly overbearing edge to it, the eerie patriotism soaked atmosphere overall, held its ground. The combination of the Chinese folk instrument Erhu ,catchy riffage and serene female vocals at exactly the right places together formed the centerpiece of the atmosphere. Yet one cannot fail to conceive the cheesy influences of Dimmu borgir and Cradle Filth running the gamut of the entire album. It was more of the same on Mirror of Retribution and rather sloppily done too. Takasago Army on the other hand was more of a departure from the said sound and relied on the more riff oriented approach. Although nothing spectacular by any means, it did appeal to a larger audience with its share of infectious melodies, group chants and ebullient patriotism. Bu-Tik picks up where Takasago Army left off, but does so in a far more memorable way. Bands that seek to ride the wave of success of their last album usually end up just regurgitating the same ol.. The result being of a slimy and pallid nature. Well this is not the case here, for one there seems to be a sudden flux of more memorable songs here than on their previous outing. While Takao and Quell the Souls in Sing Ling Temple were probably the only standout tracks on Takasago Army, Bu-Tik have five to six of them in a total of eight proper songs (the other two being the intro and outro). Be it the incipient thrash attack of Rage of my Sword, the rabid groove of Resurrection Pyre or the absolutely majestic closer Defenders of Bu-Tik Palace. Jesse Liu’s exquisite solos populating ably crafted bridge sections and absolutely massive choruses that serve to invigorate the dying conviction in one nation’s past are some of the conspicous highlights. And yes the Erhu ..the serene Chinese folk instrument.. Freddy Lim’s erhu playing elevates the said choruses to a near sublime level which is basically at the heart of every Chthonic song. Lyrically rather than sticking to a single all-pervading theme, the songs draw upon a vast array of different illustrious incidents dotting Taiwan’s fractured history. The details of which have been neatly rundown by the charming Doris over at Terrorizer. And this is probably one of the reasons why the album feels a bit disjointed in terms of flow. The songs stand on their own, but sadly don’t really develop into a self providing unit. I guess this was deliberate work on the band’s part, for they seem to be more inclined to deliver a bunch of one hit scorchers than make a statement on cohesion. The faults don’t really end there as well, songs such as Sail into the Sunset’s Fire, Set Fire to the Island and the first half of Between Silence and Death are just too lack luster to be given any serious attention at al. On the instrumental side you have the drums just managing to stay above average , a casualty of the now ubiquitous modern sound, and Doris despite her innate eye candyness seems to be doing nothing more than following the lower end of each riff. These pardonable blemishes aside, this really can be one real good session of oriental metal. With a sound lyrical approach to consolidate their musical output this makes for an interesting listen which grows in catchiness on repeated listens. This is not of a work of ultranationalist and over the brim jingoism; this represents a band mourning and celebrating the travesties and glories of a nation littered with a turbulent past, Taiwan. Watch their brand new video for their song ‘Defenders of Bu-Tik Palace’ below.